Many Black homeschoolers are disappointed to discover that traditional curricula does not include much of the African-American experience. Parents want to teach their children more than the safaris of Africa and the struggles of slavery. They want to move past usual topics of study such as the Civil Rights Movement and the Underground Railroad. Parents want to introduce their children to the rich history of African-Americans, highlight often forgotten stories like those of the Harlem Renaissance, and explore the contributions of African-American artists like Horace Pippin. However, finding a complete curriculum that touches upon all areas is impossible to find. Because such curricula is hard to find, it is useful to know how to create personalized unit studies. Doing so is a fantastic way to help ensure that Black children learn about their history. In addition, personalized unit studies allow parents to present topics in a fun and meaningful manner, help parents save money that would normally be spent on additional curricula, and enable parents to create a unit study that meets their child’s unique needs and interests. If the thought of creating a unit study seems intimidating, don’t worry. Homeschoolers have been creating homeschool unit studies for years and you can do it too. 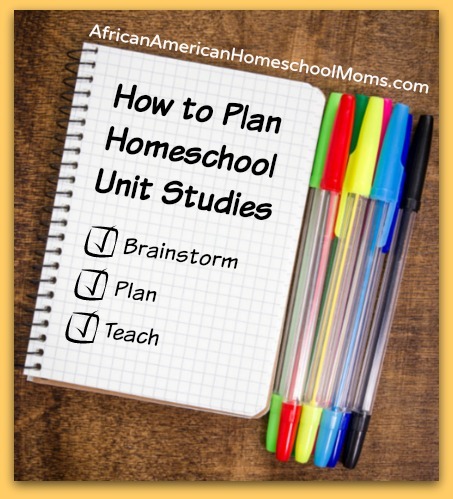 If you’re willing to plan and research, you can easily create several homeschool unit studies for your children. Let me show you how. 1. Select a topic of study. This is where the fun begins! Select a topic based upon your child’s interest or choose a topic you’d like your child to explore. You can align your unit study to match your current curriculum or branch out and teach your child something outside the curriculum. 2. Determine how much time you want to spend on the unit study. Consider how long you want the unit study to last. Will it be a short study completed in a week or will it be a longer study that lasts for a few weeks or even a month? Perhaps it is a study that will span an entire semester. The choice is yours. It all depends on how much you wish to cover and how deeply you want to delve into your topic. Unit Study Topic and Overview: What topic will you be teaching? Unit Study Time Frame: How long will you spend teaching the unit? A week? A month? A day? A semester? Unit Study Objectives: What do you want your children to know by the time you finish teaching the unit? Unit Study Subtopics: What additional topics fall under the unit’s main topic? If you’re doing a unit study on the Harlem Renaissance, subtopics that may need to be taught might include The Great Migration, jazz, and poetry. Unit Study Subjects: What subjects will be incorporated within your unit study? Art? Mathematics? Language Arts? Unit Study Field Trips: Are there outings you would like to schedule to enhance your study? Unit Study Supplies: What supplies will you need to teach the unit? This includes crafting items as well as other items you’ll need to complete extension activities. Book List: What books will you need to complete your study? Include books you’ll need to do for personal research as well as titles you want to share with your children. Website List: Are there websites you’ll be using to gather information? Are there websites you want your child to visit? Video List: What videos will you use throughout your unit? Include titles selected from your local library or titles found on Amazon, Netflix, YouTube, and Hulu. Unit Study Subjects: What will you address in each subject area? Unit Study Assessments: Are you giving any quizzes/tests or assigning reports during the unit study? Additional Notes: Is there anything else you’d like to include in your unit study? Add it in this section. 4. Gather your materials. Now is the time to go to the library to check or purchase books to add to your personal library. The materials you select should address the topic you are teaching. These will be what you use to create the lessons for your study. Here is a list of books Black homeschoolers might find useful as they plan their own unit studies. 5. Plan out your lessons. Once your unit study is mapped out, you can begin jotting down subjects, activities, and events on the Monthly Planner. From there, you can plan weekly lessons using the Weekly Planner. Are you ready to plan some awesome unit studies for the upcoming school year? If so, subscribe and download your FREE six page Unit Study Planning Packet.